The bio of George Fox | Launceston Then! 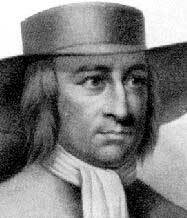 George Fox was born in September 1624 to Christopher and Mary (nee Lago) Fox at Drayton-le-Clay, Leicestershire. He was the eldest of four children who’s father, Christopher Fox, a successful weaver, called “Righteous Christer” by his neighbours, and his wife, Mary. Christopher Fox was a churchwarden and was relatively wealthy; when he died in the late 1650s he left his son a substantial legacy. From childhood George was of a serious, religious disposition. There is no record of any formal schooling but he learned to read and write. “When I came to eleven years of age”, he said, “I knew pureness and righteousness; for, while I was a child, I was taught how to walk to be kept pure. The Lord taught me to be faithful, in all things, and to act faithfully two ways; inwardly to God, and outwardly to man.”Known as an honest person, he also proclaimed, “The Lord taught me to be faithful in all things…and to keep to Yea and Nay in all things.” As he grew up, his relatives “thought to have made me a priest” but he was instead apprenticed to a local shoemaker and grazier, George Gee of Mancetter. A constant obsession for Fox was the pursuit of “simplicity” in life, meaning humility and the abandonment of luxury, and the short time he spent as a shepherd was important to the formation of this view. Driven by his “inner voice”, Fox left Drayton-in-the-Clay in September 1643, moving toward London in a state of mental torment and confusion. The English Civil War had begun and troops were stationed in many towns through which he passed. In Barnet, he was torn by depression (perhaps from the temptations of the resort town near London). He alternately shut himself in his room for days at a time or went out alone into the countryside. After almost a year he returned to Drayton, where he engaged Nathaniel Stephens, the clergyman of his hometown, in long discussions on religious matters. Stephens considered Fox a gifted young man but the two disagreed on so many issues that he later called Fox mad and spoke against him. Over the next few years Fox continued to travel around the country as his particular religious beliefs took shape. At times he actively sought the company of clergy but found no comfort from them as they seemed unable to help with the matters troubling him. In 1647 Fox began to preach publicly: in market-places, fields, appointed meetings of various kinds or even sometimes “steeple-houses” after the service. His powerful preaching began to attract a small following. It is not clear at what point the Society of Friends was formed but there was certainly a group of people who often travelled together. At first, they called themselves “Children of the Light” or “Friends of the Truth”, and later simply “Friends”. Fox seems to have had no desire to found a sect but only to proclaim what he saw as the pure and genuine principles of Christianity in their original simplicity, though he afterward showed great prowess as a religious legislator in the organization he gave to the new society. Fox was imprisoned several times, the first at Nottingham in 1649. At Derby in 1650 he was imprisoned for blasphemy; a judge mocked Fox’s exhortation to “tremble at the word of the Lord”, calling him and his followers “Quakers”. Following his refusal to fight against the return of the monarchy (or to take up arms for any reason), his sentence was doubled. In the summer of 1653 he was again arrested at Carlisle for blasphemy.It was even proposed to put him to death but Parliament requested his release rather than have “a young man … die for religion”. Further imprisonment came at London in 1654 and the following year is where his story is taken up with his journey to Cornwall and his subsequent arrest and imprisonment at the infamous ‘Doomsdale’ Gaol (below left) in Launceston Castle. The trial resolved itself into a prolonged wrangle between the Chief Justice of England, Glyn, and the accused. Commanded to take off their hats, the prisoners refused, and Fox pleaded not only the Bible but English law to prove that no necessity existed for them to do so. The judge, exasperated at this cried “Take him away, prevaricator! I’ll ferk him,” and the prisoners were accordingly ‘taken away, and put among the thieves. But presently after the judge called to the gaoler, “Bring them up again,” to which they subsequently were returned to face the judge. “Come,” he said, “where had they hats from Moses to Daniel? Come, answer me; I have you fast now.” Fox replied, “Thou mayest read in the third of Daniel, that the three children were cast into the fiery furnace, by Nebuchadnezzar’s command, with their coats, their hose, and their hats on.” This infuriated Judge Glyn, and having no reply to Fox, he cried again, ‘Take them away, gaoler.’ Accordingly they were taken away to spend the rest of the morning suffering amongst the thieves. In the afternoon they were again brought before the judge and the wrangle was renewed, beginning with the lawfulness of taking an oath, and ending with a demand from Fox, which the judge refused, that their commitment should read. Fox thereupon asked one of his fellow-prisoners to read it, as he had a copy; but the judge refused stating “it shall not be read, gaoler, take him away; I will see whether he or I shall be master.” For a third time Fox was removed, and for the third time he was recalled, when he managed once more to defeat the Chief Justice. Fox insisted to have the mittimus read; and the people being eager to hear it, he bid his fellow-prisoner to read it up, which he did according to the copy already mentioned. 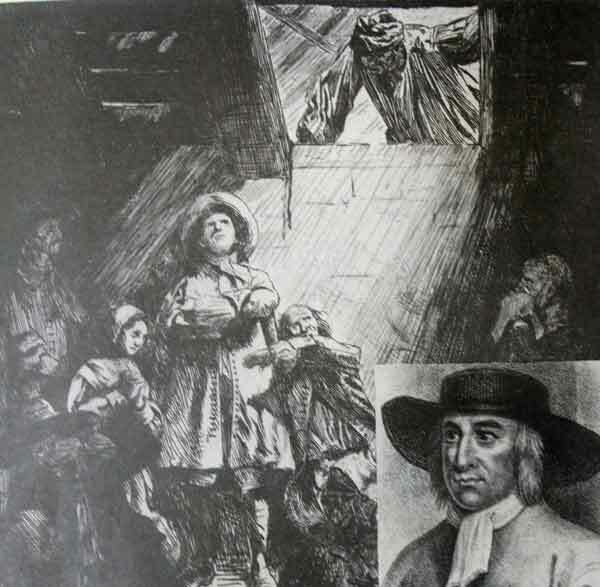 Major Ceely, having signally broken down in his attempt to prove the charge of treason he had originally brought against the three Quakers, now accused Fox of having in the Castle Green struck him such a blow as he had never had in his life. Fox demanded corroborative evidence of a charge which evidently astounded him, but this was not forthcoming, Ceely afterwards explaining that the ‘blow’ was simply a rebuff in theological argument; yet the judge once more cried “Take him away, gaoler,” Judge Glyn also fined the three prisoners twenty marks apiece, for not putting of their hats, and to be kept in prison till they paid the fine. The three refused to pay the gaoler seven shillings a week each for themselves and as much for their horses and as a consequence the gaoler as was put at the time, ‘grew so very wicked, that he turned them onto a nasty stinking place, where they used to put persons condemned for witchcraft and murder. Thus, the three Quakers continued in prison, but under less severe restrictions and were allowed the liberty to walk in the Castle Green, where on Sundays they would preach and hold disputations with professors of other forms of Christianity. Fox mentions that he was often in personal danger because of his preaching, and narrates how once a soldier drew his sword upon him, and how at another time his gaoler allowed into his cell a man who purposed to slay him with a knife. With this new found liberty ‘the Friends’ were much alarmed by the light-heartedness of the dwellers in Launceston. They protested, but fruitlessly, against Major–General Desborough (who had been sent down by Cromwell to offer them liberty if they would promise to go home and preach no more) playing bowls in the Castle Green with the justices and others (below left). Fox subsequently drew up an address ‘To the Bowlers in the Green,’ ‘to all you vain and idle–minded people, who are lovers of sports, pleasure, foolish exercises, and recreations, as you call them,’ warning them to consider of their ways and repent. Furthermore, observing ‘how much,’ to use his own words, ‘the people (especially they who are called the gentry) were addicted to pleasures and vain recreations,’ he was moved before he left the place to issue a solemn warning to then not to misspend their time. 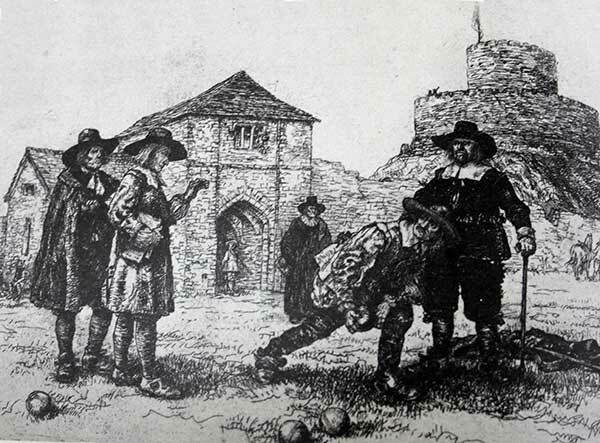 A Spence engraving of George Fox reproving the Bowlers on the Castle Green for spending their time so vainly. After remaining in gaol for six months, the three ‘Friends’ were released on July 13th, 1656. Fox left Launceston, but returned sometime soon after his liberation to visit ‘Friends.’ He twice more came into Cornwall — in 1659 and again in 1663 — but he does not appear to have again set foot in Launceston again. In the last years of his life, Fox continued to make representations to Parliament about the sufferings of Friends. The new King, James II, pardoned religious dissenters jailed for failure to attend the established church, leading to the release of about 1500 Friends. Though the Quakers lost influence after the Glorious Revolution, which deposed James II, the Act of Toleration 1689 put an end to the uniformity laws under which Quakers had been persecuted, permitting them to assemble freely.